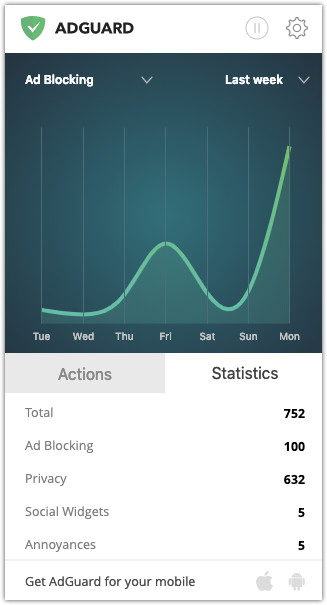 Thanks to the newly added Stealth Mode, a privacy-oriented multitool, AdGuard further stands out from the ranks of regular ad blocking extensions. Stealth Mode, without any doubt, is the headliner of the new version, but let's be patient and go over every noteworthy change one at a time. It’s true that any change starts from the inside, but in the end you’ll be judged by your looks more often than not. 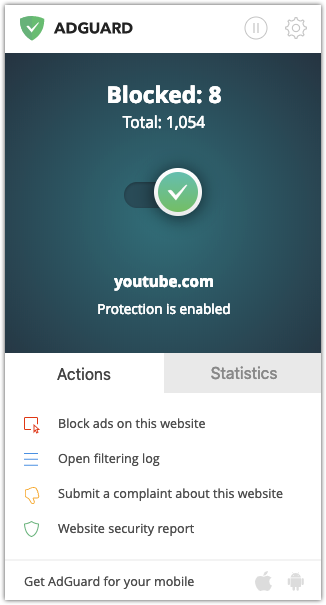 The AdGuard extension now has a new design, and it’s not just a dumb reskin. There’s a lot more to it: fresh icons and a new overall theme make the interface more natural and user friendly. In the main extension menu, you’ll also find a brand new "Statistics" tab. It features detailed numerical stats and charts, with the ability to show different types of data: filter-specific data, data for various time frames, or in total. We hope you’ll like the new design and find it convenient and pleasing to the eye. We certainly do! Now, on to the main course of the update. We’ve said it a thousand times already and will say it again: privacy is not a luxury, it is an inalienable right of each person. Unfortunately, we have to fight for this right, and the AdGuard team is proud to be at the forefront of this battle. Stealth Mode is a powerful instrument that protects your online privacy in many ways. 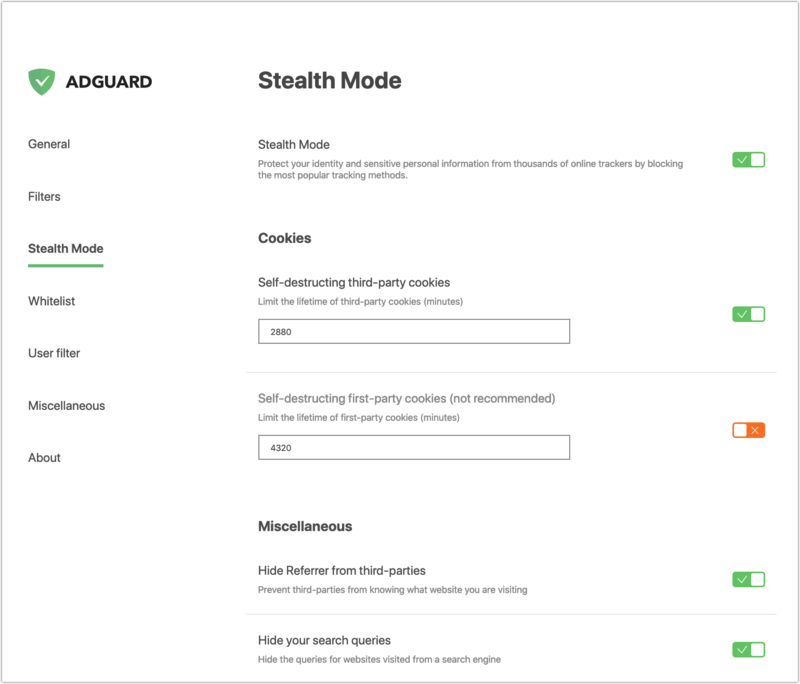 In fact, Stealth Mode is more than that: it’s a whole module that includes a wide range of tools. Previously, only AdGuard for Windows users had access to Stealth Mode; and although the browser extension version doesn't have the full capabilities of its bigger brother just yet, it still does a very good job. Those users who are new to the world of privacy protection might have some troubles understanding what this or that option does. And although all settings have tooltips, let's run through them real quick. Cookies are one of the most common ways, for websites to get information about you just by using the built-in capabilities of your browser. By disabling them (or restricting their lifespan), you will make their job a lot harder. Be careful though: restricting third-party cookies will at most cause you minor inconvenience (e.g., you will have to manually enter your logins/passwords), but restricting first-party cookies can break some websites. Whenever you visit a website, it usually knows where you came there from, and will act accordingly. For example, let’s say you want to purchase a plane ticket after browsing travel packages — tickets for you might be overpriced. By hiding your referrer you deprive websites of this luxury. Rather self-explanatory: whenever you click on a link from search results, it won't know what queries you made. Surprisingly, some websites are more polite than others, and actually will not track you if you ask them nicely by sending this special header with your web requests. Unique to the Chrome browser, this setting will prevent it from sending information about itself to Google domains. You must have noticed this before: often the link you follow contains garbage like utm_source, utm_content, etc. All these parameters are not essential in the slightest for the link to work, but serve for tracking purposes. Bonus: You can modify the list of these parameters yourself! 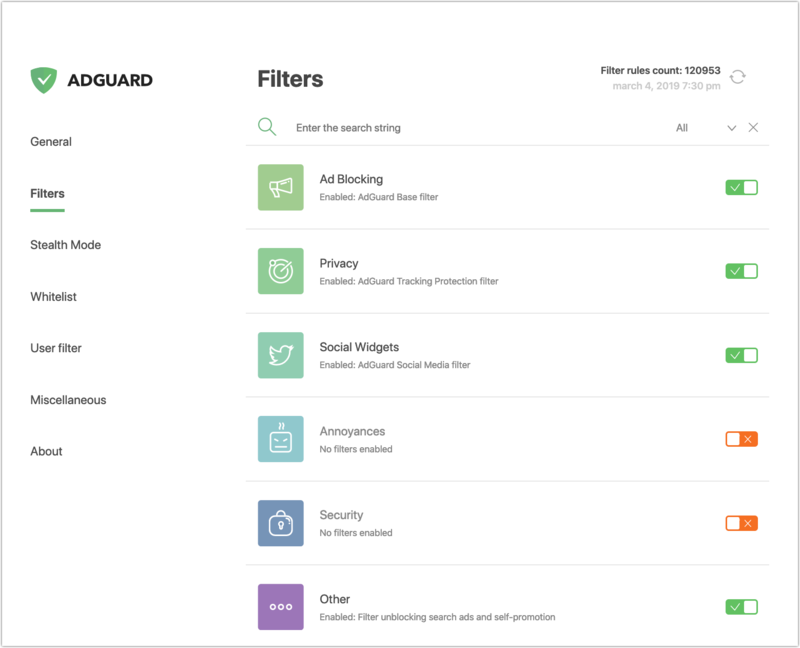 Future AdGuard extension updates will bring more Stealth Mode options, making it better and better at protecting your privacy. Going back a little, let's talk more about the new design. We changed the way in which the filters are presented to users. Instead of listing them all together, we combined the filters into semantic groups. Each group includes filters that serve some particular goal. For example, filters that block ads are grouped together, filters that block trackers and serve privacy purposes will be united into a different group, etc. Filters in a group can be enabled and disabled individually, or all at once. Note that once the group is switched off, related filters will not work, even if they are enabled (they will not receive updates either). 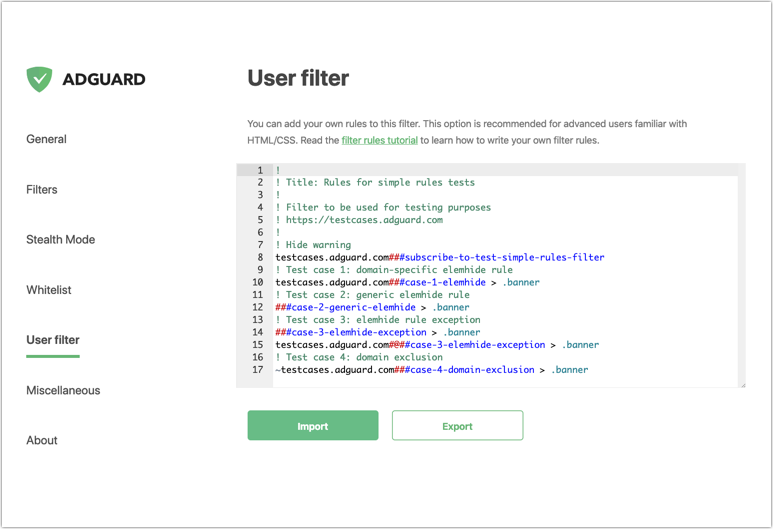 The new system should make filter management more intuitive and help new users. Speaking of filters, previously, filters were automatically updated every 48 hours (default period), end of story. Now you can adjust the frequency of automatic updates (by choosing from options: every 1/6/12/24/48 hours) or disable them completely, in case you prefer manual updates. For those who don't know, if you already have the AdGuard desktop app (either for Windows or Mac), our browser extension may become a useful addition to it. The extension can completely replace the browser-based “AdGuard Assistant” module (learn more). It is called Integration Mode, and now you can turn it on or off at will from the “Other settings” tab. This doesn't, of course, cover the entire changelog. To see the rest of the changes (totaling almost a hundred), go to the GitHub repository. Also, we would like to remind you that there is a beta channel for the AdGuard extension. If you’re interested in receiving the latest updates as soon as physically possible (and don't fear a stray bug or two), welcome into the fold. And that’s all for today! Make sure your AdGuard is up to date, and see you soon! At the moment of publishing of this post, the extension is in the process of updating. If you are using Firefox, the new version might not be available yet. To avoid waiting, you can install the beta version of the extension, it is quite stable.